I recently gave a lecture on Britain and the challenge of Soviet Communism during the interwar years and, while I was updating my rather dog-eared lecture notes and refreshing my knowledge of the latest historiography on the topic, I came across some excellent recent work on British writers who happened to be in Russia at the time of the Revolution in 1917. An article by Jeffrey Meyers in Standpoint magazine from October, 2015, and a recent book by Helen Rappaport, Caught in the Revolution: Petrograd 1917 (Hutchinson, 2016), both furnished me with some really interesting insights into the various British nationals who were eyewitnesses to the events of 1917, and who penned some important accounts of what they saw and experienced. In Meyer’s article, he explores the work of five British writers on the Revolution, all of whom were closely watched by the Russian secret police but still wrote about their experiences in letters, diaries, dispatches, articles, memoirs and novels: Somerset Maugham; Arthur Ransome; Hugh Walpole; Robert Bruce Lockhart; and William Gerhardie. At the time in question, Maugham was a novelist turned spy, Ransome was a foreign correpondent, Walpole was a Red Cross volunteer, Lockhart was a diplomat (and also a spy! ), and Gerhardie went to Russia as a soldier. As Meyer points out, ‘in the hermetic foreign community of Russia’, all of the five writers knew each other ‘and had various degrees of experience and expertise’. Knowledge of the Russian language was especially helpful. Gerhardie, for example, was a native speaker of Russian, while Lockhart spoke it fluently and, according to Meyers, ‘was sometimes mistaken for a Russian’. Similarly, Ransome, Walpole and Maugham all learned to read and speak the language. 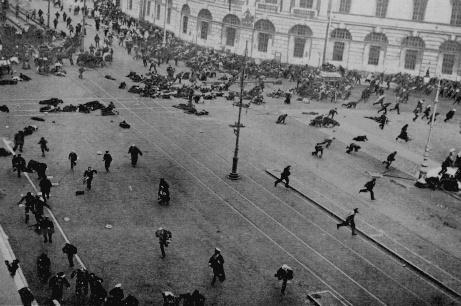 As is now well-known, Russia had – in a sense – two ‘Revolutions’ in 1917. In March, 1917, Tsar Nicholas II abdicated, ending 300 years of Romanov family rule. A new Provisional Government took control, a very uneasy coalition of parties held together by Alexander Kerensky. 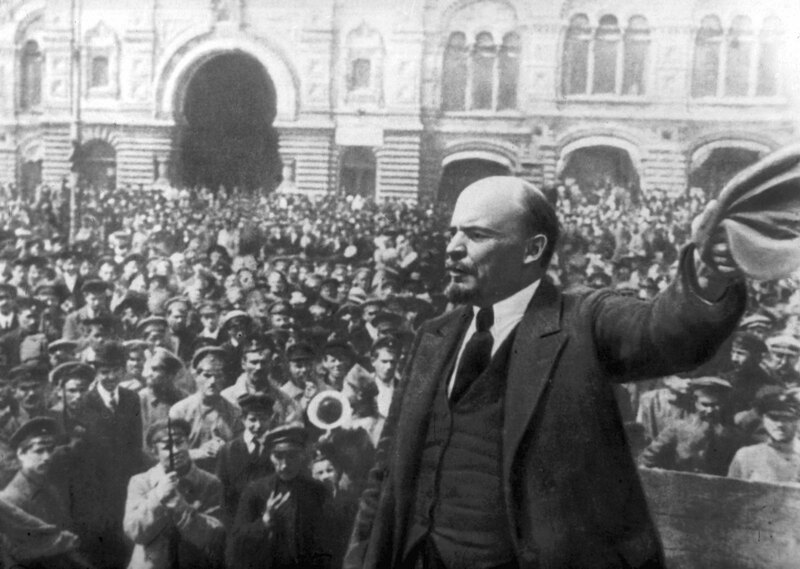 In April, 1917, the Bolshevik revolutionary Lenin (pictured), with German assistance, was able to get back into Russia and begin the carefully planned process of organising a coup d’etat against the Provisional Government, a coup which became the Communist Revolution of November, 1917. The latter Revolution first broke out in Petrograd (formerly St. Petersburg) and, with Lockhart’s help, Kerensky was able to flee the country. Lenin became Chief Commissar – effectively a dictator – and, in March, 1918, the new Bolshevik government took the highly controversial decision to sign the Treaty of Brest-Litovsk with Germany, which enabled the new Communist state to take Russia out of the War, to the evident alarm of Britain and her allies. In the midst of all this, the five writers discussed by Meyers, together with the various other writers and observers (such as British Embassy staff in Petrograd) who are discussed in Rappaport’s important new book, all tried to record what they had just witnessed, or were continuing to observe. All the individuals tried to make some kind of sense of what they saw, but to greatly varying degrees of success. The challenge for historians today is trying to work out how reliable, or not, the output of these English writers and other observers was. Inevitably, some of the eyewitness versions of the key events conflicted and contradicted each other, or simply misinterpreted things. Meyer is very good at conveying the very mixed and, in a number of cases, seriously biased accounts of what each writer saw at the time. A good example was William Gerhardie (1895-1997), who was the British military attache at our Embassy in Petrograd. In Meyer’s estimation – although he was an experienced soldier – Gerhardie proved to be an unreliable witness who ‘seriously misjudged the leaders, gravity and consequences of the revolution’. Gerhardie especially overrated the skills of Alexander Kerensky, with whom he was friendly. Moreover, as Rappaport points out, some of the foreigners resident in Petrograd at the time simply did not comprehend the sheer enormity of what was happening in both Revolutions. In hindsight, how could they? The Dutch Ambassador, referring to the November Revolution, wrote: ‘We did not realise what a great historical day we were living in’, while his French counterpart thought the Revolution was ‘too discordant’ for anyone to judge ‘its historical significance’. In the case of the British residents in particular, there was also a strange sense of ‘unreality’ among some in the community in Petrograd. The British ambassador, Sir George Buchanan, apparently kept a maid whose sole duty was to queue at the local shops to ensure that a regular supply of decent food was still served in his impressive residence (there were increasingly severe food shortages at the time, with inflated prices, and many ordinary Russians facing starvation). Indeed, Buchanan remained baffled by the events as they happened, and could not quite grasp how to deal with the very fast-changing situation (he and his other officials returned to England in March, 1918). At the risk of stereotyping the English character, it is evident that a number of British people were determined to carry on with life ‘as normal’, no matter what was happening around them. Bizarrely, as Rappaport also notes, while the districts of Petrograd had seethed with discontent earlier in the year, and trouble was already breaking out on the streets, the hottest ticket in town among British residents had still been the ballet at the Mariinsky Theatre. In the February Revolution, as rifle shots echoed on the streets, theatre patrons apparently stepped carefully around snipers to make sure they still got to a performance of Gogol’s The Government Inspector. According to Rappaport, in their weekly sewing circle at the British embassy, the aristocratic wives traded stories about the latest atrocities and their sights of severed heads on poles. One is almost reminded of a scene from a Carry On movie! 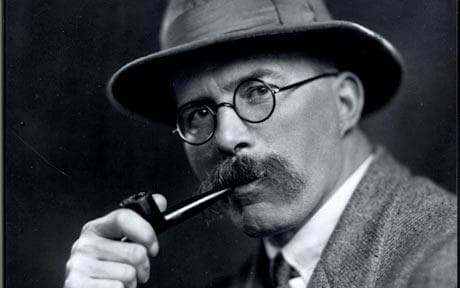 Interestingly, both Meyers and Rappaport seem to agree that Arthur Ransome (1884-1967) (see photo), who was later the author of the famous children’s classic Swallows and Amazons (1930), was one of the writers best able to capture some of the atmosphere associated with the key events in Petrograd, and offer good insights into what was actually happening in reality on the ground. Ransome was a journalist for the liberal Daily News, secretly shared some valuable information with the British Intelligence Services, and attended many sessions of the Duma (the Russian Parliament) over the volatile summer of 1917. He also personally saw Lenin arrive at the Finland Station in Petrograd and, later in the year, even started an intense love affair with Leon Trotsky’s personal secretary (Ransome eventually married her in 1924). Some of Ransome’s private correspondence to his family back in England paint a vivid picture of how tough life could be in Petrograd: ‘You do not see the bones sticking through the skin of the horses… You do not have your porter’s wife beg for a share in your bread allowance because she cannot get enough to feed her children. You do not go to a tearoom to have tea without cakes, without bread, without butter, without milk, without sugar’. He added: ‘If I ever get home, my sole interest will be gluttony’. Significantly, as Meyers argues, given that Ransom was able to get himself introduced to some of the most influential of the Bolshevik leaders, some of the ‘inside’ information that appeared in his writings remains an important source on the events of 1917 even today. This entry was posted in British history, European History, Media history, Public History, Russian History, Teaching, Uncategorized, World History and tagged British history, history, Public History, teaching. Bookmark the permalink. How could you be so wrong about when Buchanan left Russia?? Sir George Buchanan was married to my cousin Georgina Meriel Bathurst. They had a daughter Meriel who also wrote about what they witness in St Petersburg. They fled in January of 1918. They were chased by a German U boat in the waters of the North Sea! Meriel’s books include “Ambassador’s Daughter” and “Dissolution of an Empire”. Her collection is kept at the University of Nottingham. Thanks very much for your e-mail. It is especially interesting to hear that you are related to Sir George. Regarding your other comment concerning precisely when he left, can I just point out that I was reviewing the work of Meyers and Rappaport, so you need to put things into that context. But I am happy to accept it was January, 1918, rather than March, 1918. Thanks once again for your interest in the blog, and also for pointing to some additional sources. My aunt Nellie Scott was attached to the British diplomatic staff in 1917 [possibly the maid queing for bread]; I don’t know in what capacity. I do know that she and presumably other members of staff travelled via the Trans Siberia Railway and Vladivostok to Tokyo, where she left British employment for a U.S. post and was there in 1922 for the Tsunami. She told us that the journey was exactly as portrayed in the film Dr. Zhivago. Perhaps the discrepancy in dates for travel out of Russia was that the senior staff had the help of the Royal Navy, whereas other [lesser mortals] did not! Thanks for your appreciation.Just to add that she would have been 20 in 1917 [died 1983] and that she had White Russian friends for the rest of her life. One story of that period was of her friends families recovering their naval relatives bodies from the bottom of the black sea with the help if helmeted divers. They had been thrown overboard by mutinying red sailors with chains round their feet and were swaying like a field of kelp on the sea bed. Thanks for contributing and sharing such interesting historical details. I think this kind of detail gets lost with the passage of historical time but is very worthy of retrieving and sharing. Best wishes, Steven.